Originally associated with the MacGregor Tourney-branded golf clubs, the premium Tourney apparel brand blends iconic style with modern performance. Expanding further, GVC CEO Ed Byman added ““The Tourney Collection harkens back to ’60s, ’70s and even ’80s when golf style was super sophisticated.” The stand-alone apparel line currently features five polo styles, a ¼ zip Pullover, flat-front shorts, and pants. The Ace Polo has a classic fit and tailored collar. The shirt is made of 100% moisture wicking microfiber polyester pique that's easy to care for and has a soft, textured feel. Side vents make the shirt breathable in warm weather. The next shirt in the lineup is the Medalist Polo. The 100% microfiber polyester jersey material gives the shirt a soft, smooth feel. The pearlized buttons pop against the "Palace Blue" main color. The Medalist Polo boasts a classic fit, tailored color, side vents, and moisture wicking characteristics, similar to the Ace Polo. The Brassie Polo has a more vivid stripe pattern than the Medalist Polo. The luxe-feeling polo is made of 100% microfiber polyester jersey that wicks moisture away, keeping you comfortable. The Brassie Polo has a classic fit and anti-curl knit collar, ensuring you look your best at all times. The Dell Polo is a departure from the stripes and solids. The pin dot pattern pops on this classic fitting top. The Dell Polo is also made of 100% microfiber polyester jersey to help keep you dry. Rounding out the polo collection is the Mashie Polo. A subtle diamond texture adorns the 100% microfiber polyester jersey shirt. 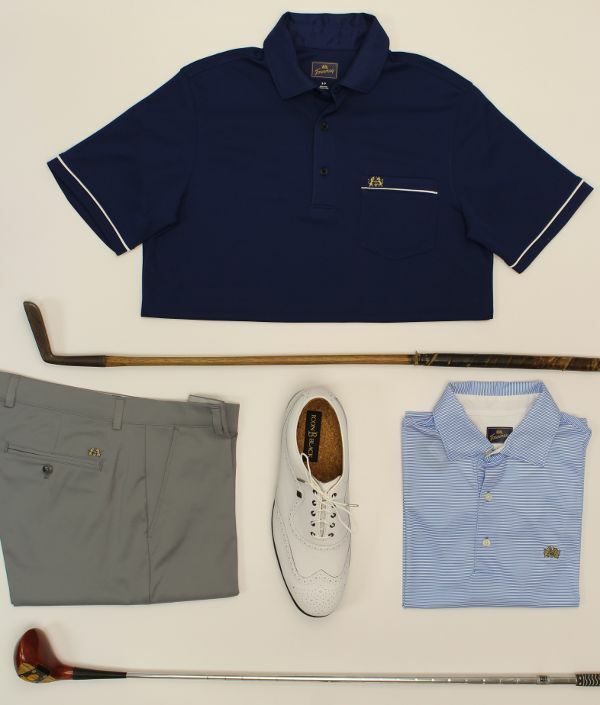 A classic fitting top, the Mashie is easy to care for. The top’s side vents and moisture wicking material will help make your next round a breeze. For stylish looks on and off the course, look to the Redan Chinos. These flat-front pants are constructed with 95% microfiber polyester and 5% spandex blend. The stretch waistband flexes as you move, safeguarding from snugness. The front pockets are slanted for easy access. The double welt pockets in the back stylishly keep things like your scorecard, glove, or wallet safely in place. The Tourney Redan shorts are a flat-front shorts, made with 95% Microfiber polyester for moisture wicking performance. The remaining 5% of the material is a Spandex blend that stretches, allowing freedom of movement while swinging. The stretch waistband, slant front pockets, and double-welt back pockets make the Redan shorts comfortable to wear on and off the course. When the weather is cooler, stay warm with the Whins Pullover. The ¼ zip pullover is made with 96% microfiber polyester and 4% spandex jersey. This specific combination moves with you while wicking moisture away. A rubber tip pull on the zipper, contrasting color details on the chest pocket and embroidered Tourney logo are just a few unique design features that set the Whins Pullover apart. That covers the Tourney apparel lineup! Shop the full Tourney line up here.